When a big cake is just too much cake this Pecan Pie Snack Cake is the perfect size! 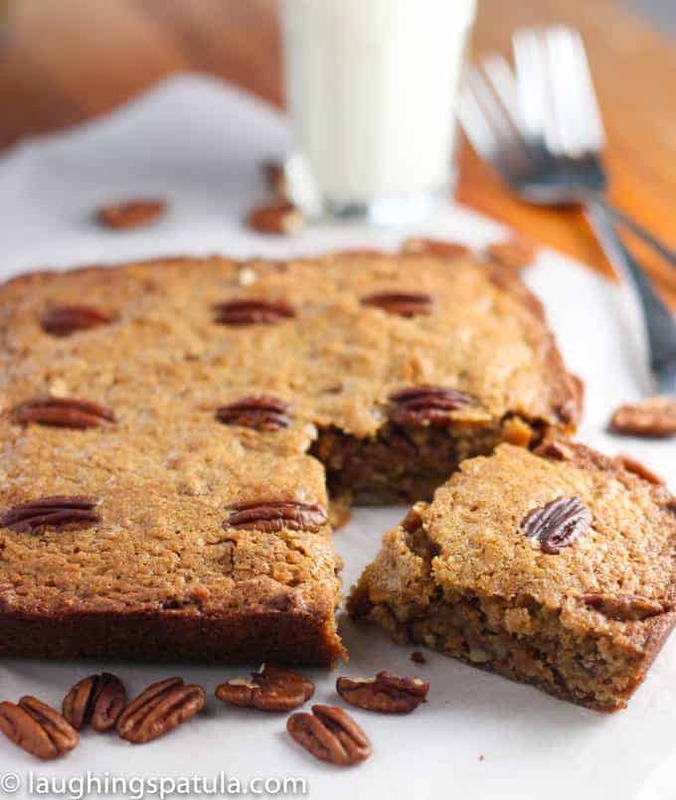 Packed full of pecans, it has a great flavor and so easy to make! 5 Ingredients, one bowl and you have yourself a tasty little snack cake. Perfect for a small family or three back to back DVR’d episodes of Downtown Abby! It is a dense cake and you will notice it uses no levelers like baking powder or baking soda. This will make Mr. Laughing Spatula’s top ten – he loved this cake…. and I’ll tell you a little secret…it’s a muffin recipe that I turned into a cake! Why? Because I love cake! But, if you prefer a more portable cake, you can pour this batter into muffin tins and have Pecan Pie Muffins. Hows that for versatile? 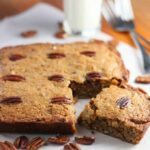 You can turn this Pecan Pie Snack Cake recipe into 12 muffins…so versatile! Actually, now that I think about it, you could probably turn any muffin recipe into a snack cake? Holy Cow, that just gets my food obsessed brain chugging along on a snowy sunday morning! Love snack cake?….you might want to try Lemon Raspberry Snack Cake as well. If I wanted to make this in a 13 x 9 cake pan, would I double the recipe? How long to bake? Hi Paula! You can double for a 9 x 13 and it will probably take about 60 minutes to bake….maybe a bit more. This is a dense cake and could take a bit longer. I have not tried it but all the foody sciency stuff says it should work! It looks good. Only one question, no baking powder, no soda? Thank you. Hi Mila – that is correct, no baking powder or soda. It is a dense cake and resembles a pecan pie that way. It works, trust me…I made it 2 times last week for gifts for my doctors office and they loved it! This looks delish! 1/2 cup of flour seems like a very small amount. Is this why the lack of leavening ingredient works?
! I double checked and 1/2 cup is correct whew! I’m no food scientist but I’m thinking the pecans make up for the missed flour. Hope you give it a try! Sorry about the scare! I’m going to try out this Pecan Cake and your English Muffin Bread this week. Thanks for the recipes. I’m glad to have found your sweet site (from a TasteSpotting.link). This will be very tastyl with a Darjeeling tea during Downton Abbey.